We've already got machines that give ophthalmologists a close-up view of the inside and outside of the human eye. The problem is they're big and heavy, expensive, and rarely accessible to those in third world nations. 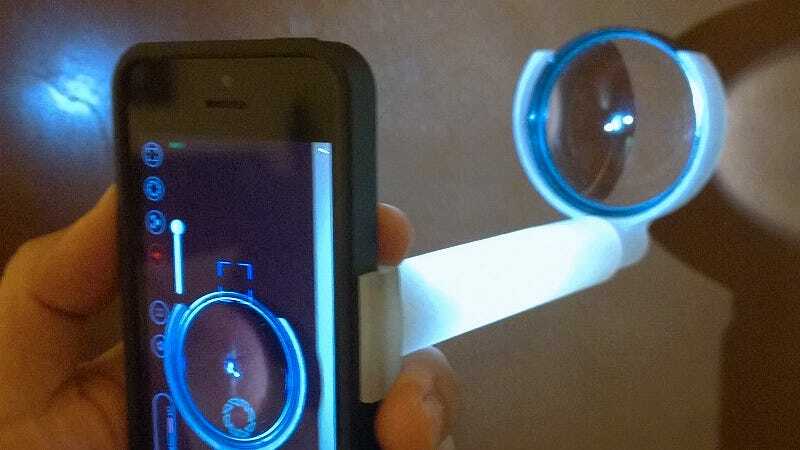 So researchers at Stanford University have created a simple iPhone add-on that lets almost anyone, anywhere, perform eye exams. Created by assistant professor Dr. Robert Chang and a resident named Dr. David Myung, the EyeGo was originally prototyped using components that are readily available online, so that the final version would be as cheap as possible. But when it's perfected, the EyeGo will be scanned so that it can simply be 3D-printed by anyone wanting one. Designed to clip on to the back of a smartphone, the EyeGo uses two adapters to allow the device's camera to take close-up photos of the outside of the eye, as well the retina inside by shining light through the eyeball's lens.